As we sat at one of the high tables in the middle of the room, I noticed the bottle of Patron tequila and the shot glasses that you can purchase, unless like me you go for one of their cocktails. I chose the Upper Old Fashioned, a drink made with El Mayor Añejo, Leopold Bros. Coffee Liqueur, demerara (sugar) and bitters. It was very good and not too strong. For appetizers, we went of course for guacamole that was also served with salsa roja and a smoked cashew sauce. It was quite good, freshly made with some chunks of avocado. 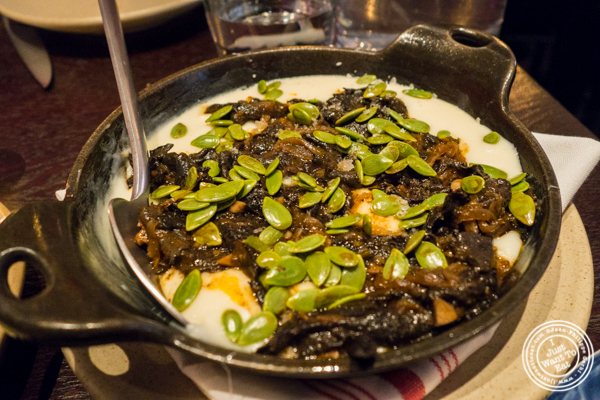 The second appetizer was melted cheese with black trumpets and guaje seeds. It came with some tortilla. It is the perfect dish if you like cheese or mushrooms. Very good, it fills you up fairly quickly. I loved these tacos (three were sufficient for me) and my favorite was the fish tacos that I thought at first, looking at it, would be dry: it was not the case at all as it sat on a lime mayonnaise and some cabbage, adding some more crispiness to the whole dish. The fish was perfectly cooked, all the way through, and moist. The lamb tacos were also delicious, very tasty and I loved the addition of the cucumber that gave more texture and a bit of crunch to it. The mushroom tacos were good, but not as much as the others. Last was dessert. I admit that I was a bit disappointed as there were only two choices and no churros that are my favorite when it comes to Mexican desserts. So we ended up with their chocolate flan that was served with a cinnamon ice cream. I loved it: it had a perfect texture and was not too chocolatey, the cinnamon of the ice cream pairing well with the chocolate. I liked our dinner at Empellon Taqueria and it would have been perfect if the music and noise level was not so loud. Their food is very good, focussing on small plates to share. It is definitely a great spot for Mexican food and I would surely go back there!